Last night, Marti and I attended a community meeting in Nanakuli, along with over 100 community members who had come to make their voices heard on the latest draft of the Wai`anae Sustainable Community Plan. In this latest draft, the City/County has opted in favor of a “purple spot” proposal put forward by a land developer seeking to push through a “purple spot” industrial zone on agricultural lands in Lualualei Valley. The public comments were overwhelmingly in favor of removing the purple spot, and keeping Lualualei as an intact, green agricultural zone. To a person, every individual who gave testimony or comments, expressed their support of agriculture and the rural character of Wai`anae. 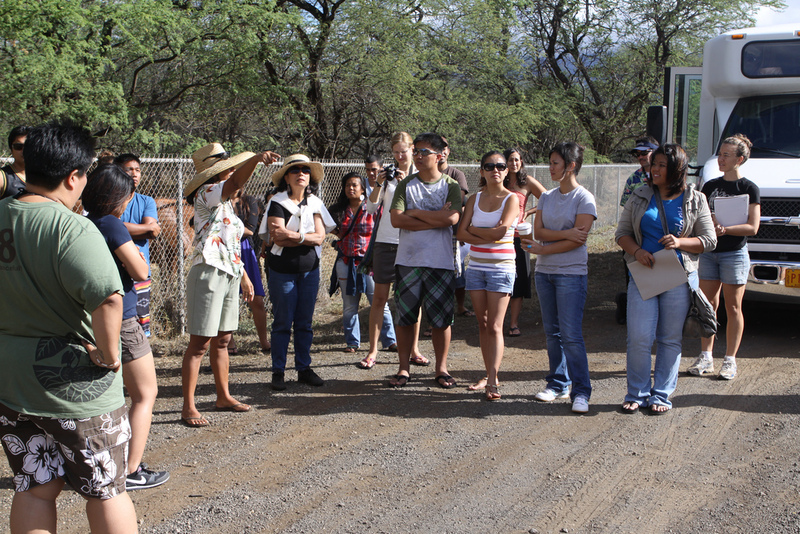 Young people came out in force, and several gave personal testimony about the Wai`anae that they hoped for, for their future. “I came out today because I heard the words, ‘Sustainable Community Plan,’ and I thought we would be talking about how we are going to get more of our people growing food, building aquaponics, feeding people. What does an industrial purple spot, have to do with sustainability?” said Sydney, a college student and homesteader. “I want to ask our youth, sitting here tonight, how many of them would farm today–right now–if they could,” queried Kamuela, a Makaha-born second-generation farmer. More than a dozen local youth raised their hands. Crazy inspiring. Many had questions about why this particular “purple spot” plan was being proposed. What struck me most, is the basic idea that it is really some guy somewhere in offices in Honolulu, choosing the map–making this tremendously weighty decision for this community. I mean, someone who wasn’t even in that crowded meeting room last night. Can you have a community plan, without a community? How does that make sense? Next steps: This draft of the plan goes before the City County Planning Commission, and then on to the City Council. We’ll be there, and we’ll keep you updated! You can show your solidarity with this community today, by signing their petition at: http://bit.ly/purplespotaction. Mahalo to Ilihia Gionson for the photo of the meeting! 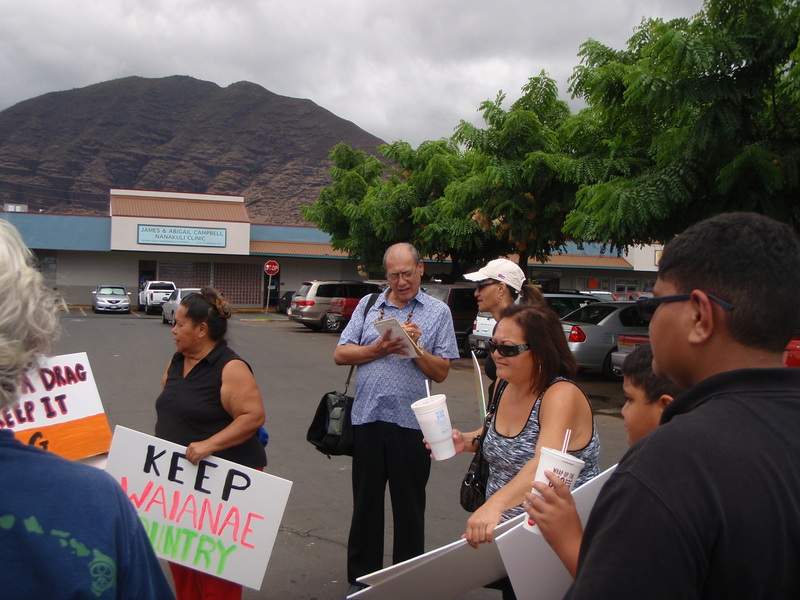 Last week Wednesday (8/18/2010) about 25 Wai`anae residents and supporters came out to wave signs expressing their opposition to a proposed industrial park in Lualualei Valley. People, young and old, and of all different walks of life stood side by side, sharing messages of strength and solidarity. We had some pretty good press coverage too, KITV and KHON stopped by, along with the Hawai`i Independent and FLUX Hawai`i Magazine. Click below to see KITV’s full story. 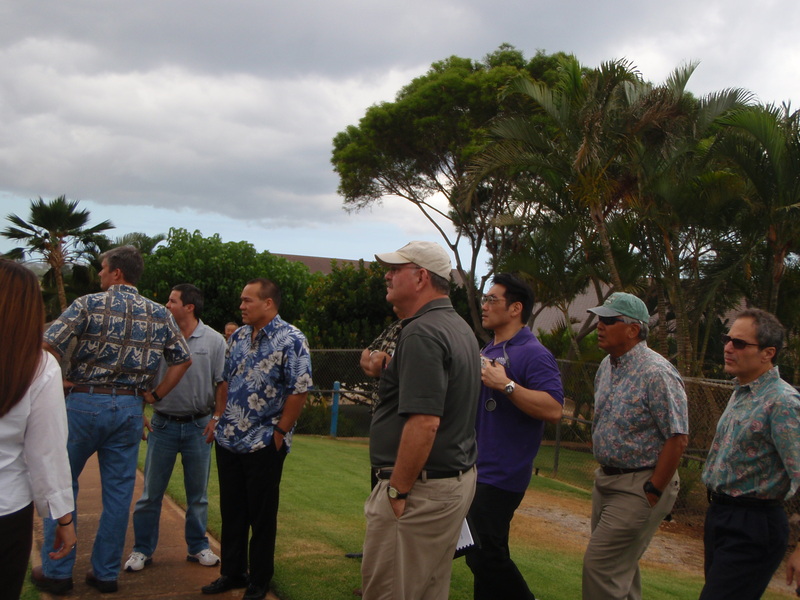 Members of the Land Use Commission made an official site visit to the parcel of farmland that Tropic Land proposes to turn into an industrial park. They drove up Lualualei Naval Access Road and then back down Hakimo Road, over the new the roadway that Tropic cut to connect the Navy Road to Hakimo Road. The Commissioners saw first-hand all of the farms along Hakimo Road, the profile of Maui, the Hoaliku Drake Preschool, and the narrow intersection at Hakimo and Farrington Hwy. Checking out the preschool along the curvy Hakimo Rd. on the way to the proposed industrial park. Also taking a moment to introduce the group to our kupua, Maui! Interestingly, just seconds after the developer’s attorney said it was too hot and arid to grow palm trees on the property, the sky opened and big drops of rain fell. We got drenched as we drove down Hakimo Road. Umbrellas out in full effect as Lono gives kokua to show the commissioners that it does indeed rain in the valley! The latest scoops from legal intern Tyler on legal proceedings around the push to protect agricultural and preservation lands in Waianae currently threatened with industrialization. 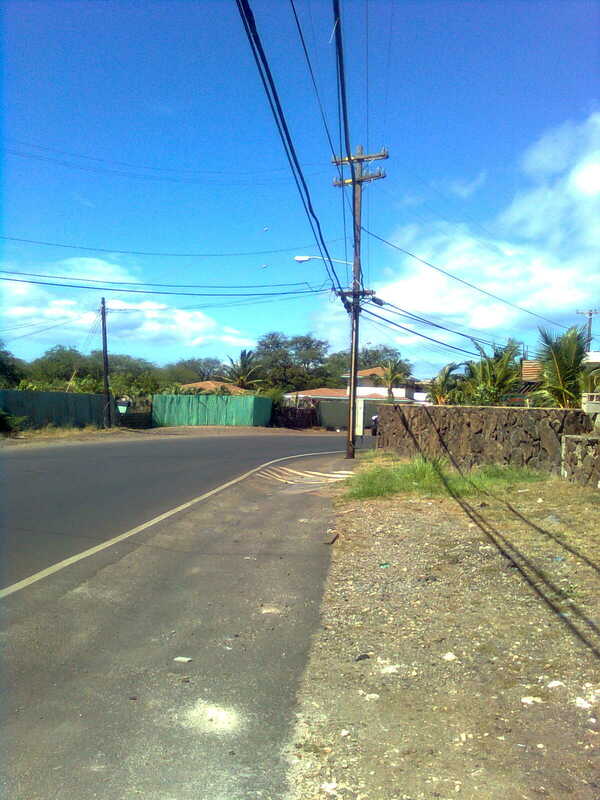 Fenceline to farms and homes, an industral park and new landfill are proposed on this area in the middle of one of Hawai’i’s largest communities of Native Hawaiians. It’s a justice thing, and it’s a kākou thing! Think of this as a game of Monopoly. Tropic Lands owns a parcel not on the game board. Let’s call it Insensitive Avenue. They really want to be in the game, because they believe they can make a nice chunk of change. But they can ONLY do this on Insensitive Avenue. So what do they do? They cry “JOBS!” and then they ask the state Land Use Commission (LUC) if they can amend the rules and put Insensitive Avenue on the game board. The problem is: If we let Insensitive Avenue on the game board, then we MUST put Greedy Place and The Capitalism Railroad into play. And in fact, this is the purpose of the rules. The reason Community Plans and Zoning Regulations are made? To prevent unruly development in a community and to maintain balance. Not to mention mediating ongoing insensitivity to cultural concerns. We understand the need for economic development. We understand the need for jobs in Wai‘anae. In actuality, all we’re asking is that you put your industrial park in an area that is compatible with your development plans. Like… Maybe put the industrial park in an already industrialized area? That seems fairly logical to me! How about you folks reading this? This area is Preservation/Agriculture Land. Let’s keep it that way. There are some incredible alternatives being proposed by communities members–everything from a gateway park to an agricultural incubator. Now that the big kids know what we’re playing for and why, we gotta show them what we’re playing with. The Scottish Terrier. Or the thimble! Joke. In fact, we’re playing with people who are experts in their fields, and we believe their expert testimonies will expose to the Commission some undeniable truths behind this bad proposal. Aunty WalterBea shares stories of Mauikupua, the demi-god. Powerful! More at their blog. Mahalo to Nakem Youth member, Mark Fiesta, also for putting up such beautiful photos of the event. Here’s a link to his blog. Solidarity is a beautiful thing. 🙂 Mahalo to everyone for coming, if you are interested in joining our next tour, it is on August 28th. Email shelley@kahea.org for more information. The Ho‘ike for the second graduating class of Ka Makani Kaiaulu o Wai‘anae that was held last friday totally renewed my internal spring of hope for the future of Hawai‘i. Ten young people with nothing in common, but their home along the Wai‘anae Coast, came together to learn about the history and power of social justice movements in Hawai‘i and around the world… and they got to participate in a little movement building themselves. KAHEA staff had the honor of working with this youth during this summer program. We helped with some of the curriculum and encouraged them to participate in the LUC hearing on the Concerned Elders’ Petition to Intervene in the reclassification of ag land for an industrial park. These students are an inspiration. Smart, compassionate, and full of possibility. The hope is to continue this program next summer or maybe even expand it into a year-long program. To do that, though, would mean a lot of community support and financial backing. If you are interested in donating to this program, click here. Here is a link to the full story on the Ho‘ike in The Hawaii Independent. This past Saturday, a small group of determined “door knockers” set out to give a heads up to residents on Hakimo Road in Lualualei about a proposed industrial park planned in their neighborhood of small farms and homes. Of all the 30 or so people we talked to, not a single person had heard about or been notified of these plans to industrialize the valley. I have to admit, I was nervous going into a rural community knocking on doors, but everyone was really nice. They were thankful we came by because otherwise they would have never known that an industrial park is being proposed. Of course it helped being with Aunty Alice Greenwood, who everyone knows, and it felt good to hear people express their gratitude for her determination to fight. Those kind words are important to me because I’m always wary to get into other people’s business–knowing that we have their blessing and request to move forward tells me that we’re on the right path! One thing that really tugged at my heartstrings was meeting more than one family that lost their farm in the Kalama Valley evictions in the 1970s. 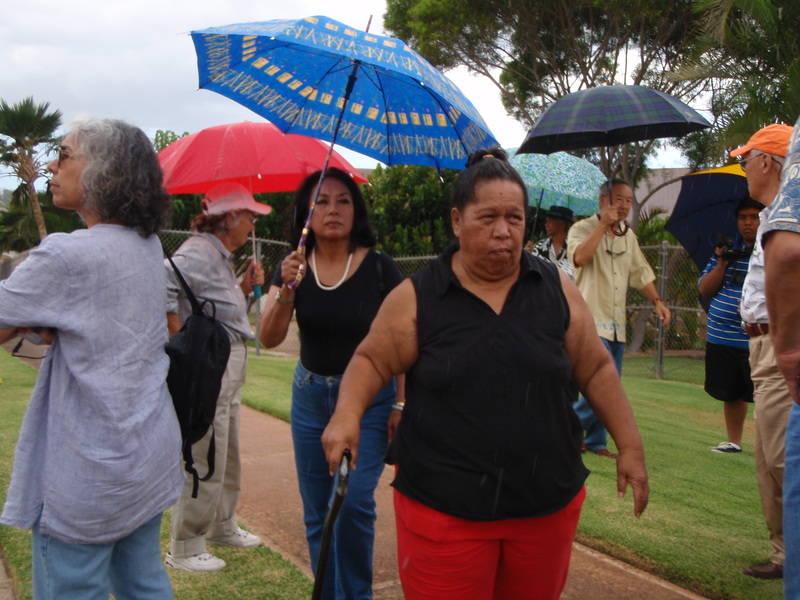 These families relocated to Wai`anae and 35 years later are again facing the displacement of their family business and rural lifestyle- -from some of the same developers! If you have ever been on Hakimo Road you will know that 1) there are NO sidewalks, 2) it is narrow and winding, and 3) is already dangerous at the current traffic level, let alone with the addition of over 500 big trucks! One resident pointed out to us, “Go walk up and down, you’ll see flowers at almost every turn marking all the accidents!”–it was so sad, she was right. There’s a preschool on this road and many residents are worried about the health and safety of the kamalii (little ones) who go to school there. Can you imagine if this was going on in your neighborhood? You can sign here to stand in solidarity with this community! Welcome Tyler Gomes! Tyler is serving as a summer legal Fellow at KAHEA through the Center for Excellence in Native Hawaiian Law at the UH Richardson School of Law. He has been working at KAHEA’s Environmental Justice Program, assisting Staff Attorney Marti Townsend with a petition by the Concerned Elders of Waianae to intervene at the state’s Land Use Commission. Last week, Tyler was witness to an amazing victory–the LUC unanimously granted the Elders petition! This intervention will allow them them to formally bring evidence and testimony about why they oppose changing the zoning of a large parcel of agricultural and preservation land to allow industrial land use. This zoning change would allow the construction of a large industrial park next to small farms and homes in the back of Lualualei Valley on O’ahu’s west side, and pave the way for a proposed new landfill. (The developers are also seeking this zoning change through the Sustainability Plan process, which we’ve written about here.) This community is a population center for one of the largest communities of Native Hawaiians in the islands. On July 1, the Land Use Commission held a preliminary hearing on whether the Concerned Elders of Waianae can intervene on Tropic Land’s proposal to reclassify farmland to urban and build an industrial park at the back of Lualualei Valley. 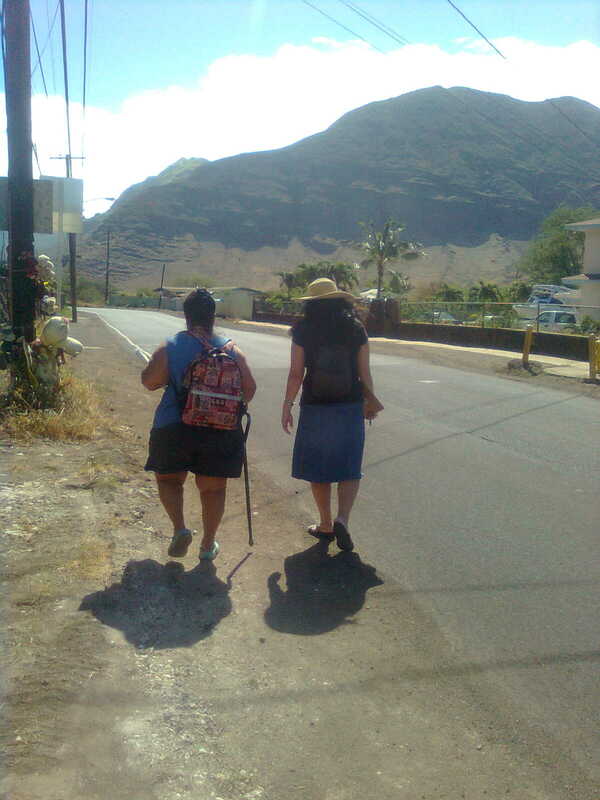 The Concerned Elders are an all-volunteer group of mostly aunties who want to protect the Waianae they love. In the process to change a boundary classification (whether a piece of land can used for a farm, a house, or a shopping mall), the LUC gives a chance for people other than the property owner, the state office of planning, and the city department of planning to also be parties to the decision-making process. As parties, you get to put on evidence, question the other parties’ witnesses, and make detailed written suggestions to the LUC every step of the way. It is a lot of work and it is not easy to get. But, the Concerned Elders wanted to be at that table. So our sole obstacle was: prove that the Elders have a reason to be at the table. But…sometimes…things don’t happen as planned. Sometimes somebody might miscount a day and miss the filing deadline. That’s exactly what happened. I know. It was heartbreaking for all of us. We were told — on multiple occassions, by multiple people — these LUC rules are complicated and hard to follow and totally unforgiving. That was where our second obstacle came in: how do we address the fact that we filed late? Thanks to some creative legal research I found a “Motion to Waive Commission Rule.” It had gotten a pardon for other mistakes made before other commissions in other jurisdictions, maybe it would work here, too. So, we immediately filed a follow up motion to support our petition… and waited for Tropic Land’s response. Nothing came. Did they waive their objection to our request to intervene? Highly unlikely. We called the LUC. No, they did file an objection, but they just sent our copy to the completely wrong address — someplace in Oregon. Here was our chance! Surely the LUC would forgive our one-day late filing, when a fancy, well-experienced law firm could make a similarly human mistake. We were back in the game; admittedly, with only one day before the hearing to file our reply to their opposition. In 24 hours, we wrote a brief to answered every one of their objections to our intervention, got declarations from members signed, made 20 copies of everything, collated it (on the floor) and served it — properly — on all parties. So the LUC hearing addressed two things: 1) Should the LUC give us an extra day and excuse the late filing? and 2) Should the LUC give the Elders their seat at the table? 8:20 AM- Marti and I trek to the office from our parking gravel pit (four blocks away)…IN THE RAIN. 8:30 AM- We get in and begin prepping whatever documents she may need to reference, getting everything in order, whilst drying off. 9:00 AM- We get to the LUC and students from the Kamakani Kaiaulu O Wai‘anae are all there prepared with signs and speeches. They’re excited. It seems to be the general mood of the morning. Kind of like static electricity, but the good kind. 9:15 AM- The room is already filled, and we’re second on the docket. So there’s a crowd outside. The LUC staff is adamant that the public testimony needs to be about why the Elders should be given their seat, NOT why an industrial park should be built in Wai’anae (though there are so many reasons). 9:30 AM- The first item is up on the docket. Some of the kids sit inside to listen with Aunty Alice and Ms. Nordlum. The first item is a status update, so this should end quickly. Marti, Aunty Walterbea, Shelley, Miwa, Kanoe, Ms. Stack, and myself sit outside on the floor and prepare. 10:00 AM- Still waiting. The excitement is wearing off. 11:00 AM- The LUC takes a break and lets us know to come back at 1:30 PM for our hearing. The kids are a bit restless because they’ve been sitting for almost two hours, and now we need to make arrangements because they weren’t anticipating staying in town for so long. The kids’ testimony also needs to be edited. There is concern that the LUC may be a bit touchy after the long morning, and having multiple kids each read a piece of the testimony may not over well. They decide that they’ll all stand, but one student will read the testimony. The kids go on a downtown field trip for lunch. Marti, Shelley, and I head to the office to regroup and rethink. Many of our Elders have to leave because of the unexpected plans. 1:30 PM- Back at the LUC. We’ve had lunch and talked it through. We’ve got answers for every question they could throw at us. Exhibits. Caselaw. The Wai‘anae Sustainable Communities Plan. The EIS — tabbed ad infinitum. We were set. Some might think us “rag-tag,” but even rag-tag can never be too prepared. 1:35 PM- The head of the LUC reminds us that our public testimony should not speak to the merits of an industrial park; just why the Elders should get their seat at the table. It seems to be a point of concern for the LUC. 1:40 PM- At this point, the excitement got so high, I don’t really have any concept of time. They begin. The Kamakani kids give a great testimony about why the kupuna should be admitted. Heartfelt. Tearjerking for some. Legit. Then Aunty Walterbea offers her testimony. It spoke to the point and was so real. Marti asked Aunty Walterbea some clarifying questions in order to strengthen the arguments. The LUC asks for any more witnesses. No others? Wait! One of the Kamakani kids, Kimi Korenaga, volunteered to give her own testimony, much to everyone’s surprise. She spoke about how the kupuna have offered her such a unique point of view in life, it would be unwise to dismiss the kind of knowledge and insight they have in the proceedings. She brought the hammer down on the nail’s head. The LUC then asks Marti for her argument about our shot-in-the-dark “Motion to Waive Commission Rule.” Marti takes full blame for miscounting the days. True leadership. While anyone could’ve caught the mistake, Marti explains to the Commission that she miscounted. She then cites a Supreme Court case that procedural rules are not there as a “game of skill” to boot out players on a small slip-up, but rather ensure a “proper decision on the merits.” Marti continues on about how we fixed the issue immediately in less than 24 hours and we have proven that we are committed to a fair process. Commissioner Devens clarifies: it was just miscounting, and it was rectified immediately. Marti also reminds the Commission that anyone can make this mistake, and that even Tropic Lands can sympathize with the inability to serve papers on time. 8-0! Unanimous. They’ve waived their deadline rule, and without hesitation grant us the extra day…which means we aren’t technically late anymore! Again, Marti gives our statement. Emphasizing the unique interests of the Elders. Explaining why the Elders will be affected by the outcome of this decision, and therefore they should participate in this decision-making process. Commissioner Devens again asks for clarification regarding the Elders’ group itself. Marti explains about the history of the Elders. He’s satisfied. Tropic Lands, unsurprisingly, objects with no comments. The DPP does not object. The OP conditionally supports our petition. The Commission throws down a motion to grant our petition. Whoa. Wait. Where’s the questions? And the interrogations? We have citations! And papers. Lots of papers! And answers! We have tons of answers! But that seems to be it. The staff prepares to take the roll call. But wait, the OP has one more question. The petition to intervene says that Marti is currently the attorney for the Elders. Will there be someone else? Marti, very humbly, tells the Commission that we’re actively looking for a more experienced attorney who “knows what they’re doing” because this is the closest she’s come to this type of work before the Commission. She asks the LUC for any suggestions. They laugh (this disproves my theory that Commissioners are robots.) Marti explains, though, that until they find someone, she has vowed to stand by the Elders until the end. Very chivalrous. The Deputy Attorney General tells Marti that she’s doing a great job, because, duh, she is! At this point Marti, Shelley, and I have this odd moment of clarity. You know that feeling where you realized you’ve prepared yourself so much more than you ever needed to? That’s the feeling we got. 1 yes. 2 yes’. 3…4…5…6…7…and…8! YAHTZEE!!! Again unanimous. There seems to be a common air of disbelief at how simple it all was. Tears are shed. Many tears are shed. Two wins in a row provides great momentum for the hearings to come! We regroup in the lobby and discuss how great it went. There are some fantastical dance moves thrown around. Some wildly giddy laughs. A plethora of smiles. Hugs and kisses. More dancing, just me though. Marti thanks the kids for coming out and representing their communities. They perform Oli Mahalo to the Elders that were able to stay, and Aunty Walterbea responds with Oli Aloha. It all seems so….balanced. Pono, if you will.